I want to share some early prototypes of one way gov.uk/performance could grow over the next year or two. Right now we’re showing detailed data for individual transactions – things like Book your driving test and Renew a patent. We want to connect these transactions together to show how a whole service is performing. Each service covers a whole user journey – things like learn to drive and protect your intellectual property. We've made a prototype dashboard for the service 'learn to drive'. This is an interesting example because 2 government agencies, the DVLA and DVSA, are responsible. It contains several transactions in 4 broad stages, plus information on GOV.UK. The transaction links take you to your existing dashboards, eg Book your practical driving test. The pages on GOV.UK links will take you through to our recently launched /info pages. 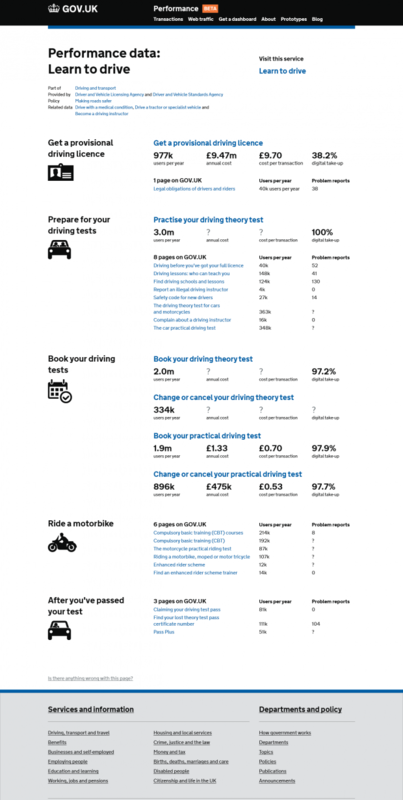 These are mini dashboards for every page on GOV.UK, eg Legal obligations of drivers and riders. One of the main objectives is to show where we don't have any data as well as where we do. Service dashboards won't replace our existing dashboards. It's designed to give an overview of multiple dashboards in one place, spanning across both the DVSA and DVLA. You can join in the discussion below in the comments on our hackpad page.